Imagine for a moment that the vehicles classed as large luxury SUVs were members of a colony of sorts. Which of them would you deem king? It’s a tough choice, but if we had a vote in the proceedings, the Infiniti QX56’s chad would most likely be dangling from its resting place. Let’s review the necessary qualifications of this prestigious honor, just to be sure. First and foremost, a luxury SUV is required to be comfortable and seat at least half a soccer team. It must effortlessly glide along freeways and Westfield shopping center parking lots. And for the win: Gizmos and gadgets have to be plentiful enough to entertain the aforementioned soccer team. The QX covers all the basics and then some: seven leather-swathed seats, a smooth, comfortable ride with minimal body roll and standard navi will keep occupants on the verge of bliss. Nailed it! 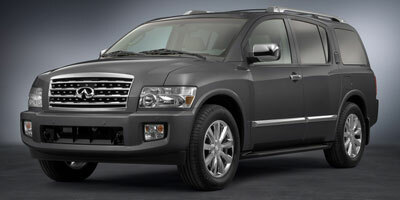 It seems like the luxurious and lavishly large Infiniti QX56, brother of Nissan’s Armada, displays competence in every possible category for this type of vehicle. We’re not sure how pretty it will look in a fur-lined robe and crown though. Comfortable seats and a sophisticated interior design make the driver forget that the QX strongly resembles a WWII tank. High towing maximums allow the SUV to pull a trailer or boat without any worry. A laundry list of standards – including navigation and a rearview camera – ensure the price tag won’t travel far beyond the base MSRP. Exterior design will be too jarring and aggressive for some. Angular lines make the large SUV seem like the Queen Mary II in scale. There are niggling issues with the drive, we’d advise against bringing the QX within 10 miles of any city limit, and $1,700 for a DVD system is pretty steep. As with any large SUV, there are certain sacrifices that come with its immense size and weight. The QX is no exception, and its mass is slow to get moving off the line. Direction changes aren’t quick either, despite the suspension keeping body roll down to a minimum. But once it gets up to speed, the thing is like a juggernaut, with only the 13-inch disc brakes able to slow it to a stop. Its V-8 engine has enough mid-range power to really pull the SUV along the road, with the amount of torque surpassing that of the LR3 and Mercedes-Benz GL450. Steering is, as Pink Floyd would have contested, uncomfortably numb; the best you can do is turn the wheel and hope the tires are pointing in the right direction. We also found it unsettling that the hood is large enough to momentarily blind the driver when cresting hills. The 5.6-liter V-8 engine produces 320 horsepower and 393 lb-ft of torque. A five-speed automatic transmission puts power to the rear wheels or all four wheels depending on the model of your choice. In the AWD trim, a dial on the dash lets you switch between drive types, or you can stick it in auto mode, which adapts the AWD system to the terrain. 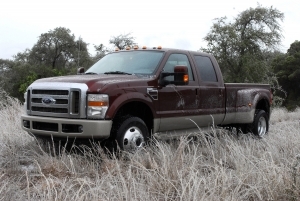 Towing maximums reach 9,000 pounds for 2WD and 8,900 pounds for AWD, a trim that includes a standard tow package. For $1,700 the QX56 comes equipped with a DVD entertainment system featuring a ceiling-mounted, eight-inch monitor, remote control and two wireless headphones. Though, without a package you’ll find plenty of trimmings as well. Bluetooth connectivity and navigation come standard, as does a rearview camera to assist in backing up. The Bose CD/MP3 player with a subwoofer and 12 speakers will keep even the third-row occupants grooving along. Intelligent cruise control uses lasers to search out the distance between you and the car in front, slowing the QX to within a preset distance while cruise control is enabled. The QX will also accelerate until it reaches a predetermined speed once traffic begins to flow again. In the grand tradition of slow moving heavyweights, gas mileage is once again an ignored issue. Numbers for the LEV-II rated QX56 are unabashedly bad at 12 mpg city, 18 highway for the rear-wheel drive and 12/17 for all-wheel drive. The entire segment delivers fuel consumption similar to this, making them equal offenders in this case. Three rows of seats come standard in leather, and the first two have standard seat heaters. The center dash is less overwhelming than many of Infiniti’s, but buttons still feature heavily on both the right and left hand side of the driver. Third row legroom is truncated dramatically compared to the generous space offered by the second row. The exterior has somewhat rounded edges, but the body design is broken up by alarmingly rigid and angular lines. Without a truly smooth shape, the QX looks every bit of its 5,700-pound curb weight and 206-inch length. The AWD trim adds skid plates, a tow package and splash guards. All models ride on 20-inch wheels. The QX56 appears to be priced competitively in comparison to the rest of the field. It starts at $55,050 for the RWD and moves steadily up to $58,150 for the AWD. A few undercut it, like the Lincoln Navigator at $52,440 and Land Rover LR3 HSE at $54,800. All others – the Cadillac Escalade ($62,545), Mercedes-Benz GL450 ($58,200), Audi Q7 4.2 Quattro ($59,220) – see much higher starting prices. Despite our gripes about this being the most massive vehicle (ever! ), we know that the QX is supposed to be defined as such. For the money, it’s a supremely relaxing SUV to drive and the well-appointed interior instantly feels like home (if only because it’s the size of some). The niche that the segment fills may not be around much longer – the QX’s mpgs are a testament to that – but we think it deserves recognition as one of the best in the class.